Put down the laptop. Since February 2013, the health vertical has seen 219% growth in unique visitors on mobile. Fitbit and MyFitnessPal are top mobile performers used primarily by women, who outnumber men 2 to 1. ComScore’s new fitness data tracks the explosive mobile growth, which shows no signs of slowing. Now, where’s my Apple Watch? Under Armour and MapMyFitness are working with sports equipment retailer Sports Authority to link workout activity with customer loyalty programs in a data play that is part of Under Armour’s efforts to become a technology company. The companies are working together to create a new set of “challenges” on MapMyFitness, the workout-tracking app that works with phones, Jawbones, Garmins and Fitbits to track calories and workouts. Under Armour purchased MapMyFitness last year. 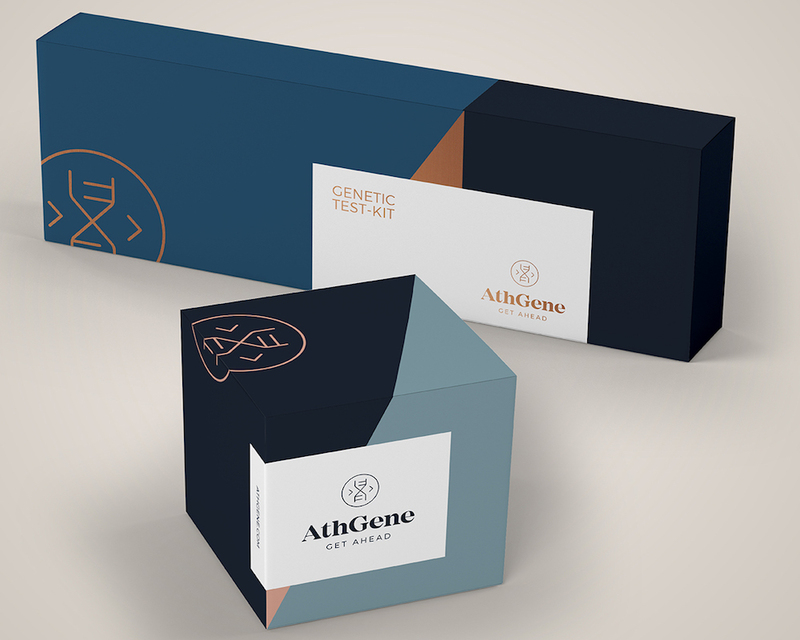 The 150 million people within the “Under Armour Connected Fitness” group will get a set of challenges (for example, “run 10 miles a week”), and if they complete it, they can win gift cards and points within “The League,” Sports Authority’s loyalty program. Warren Kay, vp of advertising at Under Armour said that Sports Authority is looking for a way to invest in technology to strengthen their market position — and using Under Armour’s verified activity feed is a way to get data on those customers and marry it with the rewards program. Kay said Under Armour differentiates from competitors because it has opened its API and platforms to other brands and hardware manufacturers like Fitbit or Garmin — and lets its customer play across platforms — instead of creating its own hardware. Still, it requires a lot of resources, and a lot of money. Under Armour, for example, bought nutrition- and workout-tracking leader MyFitnessPal earlier this year, plunking down $475 million for the company, and also put down $85 million for Endomondo, a social fitness network. Connected Fitness is the part of Under Armour that houses the technology to help its athletes and users: MyFitnessPal, Endomondo and MapMyFitness all live within Connected Fitness unit. The payoff for Under Armour is partnerships like this one with Sports Authority. 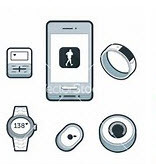 Active people that use fitness trackers are likely to buy apparel and footwear. And hopefully, they’ll buy yours. 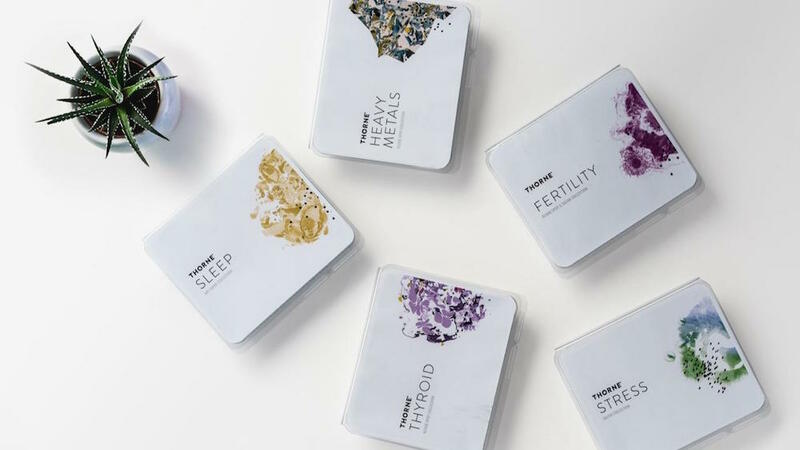 This is a really smart way for a retail brand to think smart about how to grow itself. They are transforming the brand to own fitness in general- by providing the clothes people wear when working out along with the apps they need to track performance. People could soon associate the brand or the apps they bought as more of a lifestyle choice than a simple tool or piece of clothing…which adds brand equity. Today, the most popular type of wearable health device is the fitness tracker, embraced by fitness enthusiasts, data geeks…primarily, the intersection of the two. However, wearable technologies have the potential to measure much more than steps, distance and calories; extending to glucose, blood pressure and brainwaves. The implications for healthcare are significant. Physicians are already reporting that wearable technologies are helpful for patients managing obesity (the obvious), as well as diabetes, heart disease and other conditions. Wearables can also improve on-the-job safety by monitoring alertness, location and time/performance. In areas where access to physicians is limited, wearables are particularly important; helping the consumer or patient to take charge of her own health. In this presentation, Wearable Medical Devices, implications for rural India, where there are fewer than 1 doctor for every 10,000 people, are explored. While wearables could help reduce dependency on these very few doctors, barriers to penetration include: price, positioning as a fitness vs. general health/wellness device and lack of marketing in local languages. By addressing these barriers, wearable technologies will gain access to huge untapped populations. One can even imagine a future where health insurance companies offer discounts to people who wear the devices, just as car insurance companies have done for drivers who have installed wireless devices to track when and where their car is on the road. 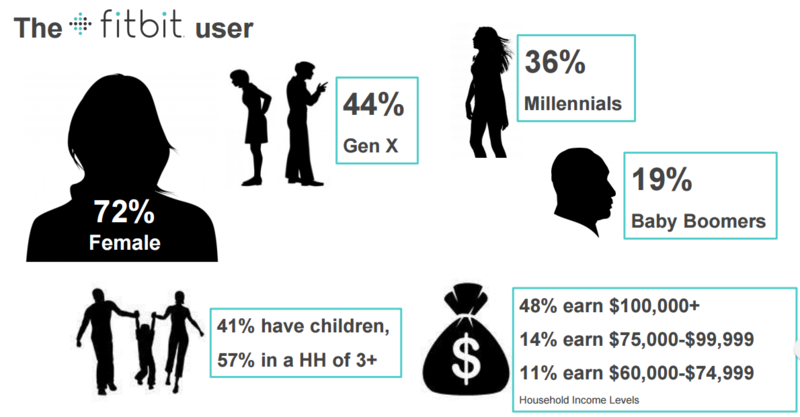 Why It’s Hot: Real-time feedback on health will greatly change consumers’ behavior; how they engage with health/condition-related content on the wearable, the web, et al., as well as how they engage with their caregivers/families and healthcare providers. In-person doctor visits may become less frequent, as wearables make patients more self-sufficient, as well as facilitate remote care/treatment of the patient by the doctor. Pharma marketing channels, such as in-office magazine wraps and television commercials, EMRs, wearable in-app ads, et al., increase/decrease in penetration and effectiveness. 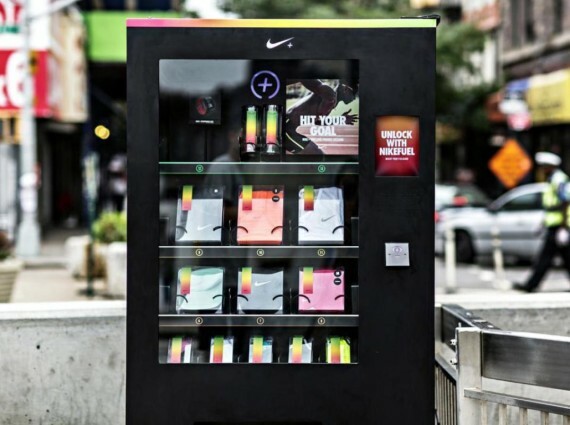 Nike unveiled a public vending machine at the entrance of the heavily trafficked Williamsburg bridge in New York City. People can only access the goodies inside the machine by scanning a Nike Fuelband and using the accumulated NikeFuel points that can be obtained through the use of the Nike+ platform. The machine inventory consists of Nike merchandise in the form of socks, hats, t-shirts, and other Nike equipment. It is unclear how long the machine will be at the location and if there are plans for a city-wide campaign featuring more machines. Nike has taken a virtual, online only currency and made it useful in the real world. This gives NikeFuel points more importance as well as creates a unique real-world experience that could previously only be accessed through online portals. Players can’t cheat about what they do and fast they get there. The game taps into a mobile phone’s accelerometer to measure gait. It takes virtual reality one step further and makes it part of real life. It’s a new and physical way to play a video game. And although not a health app, physical activity is baked into this game. The player becomes the game and does the actions. Stop that gym membership. 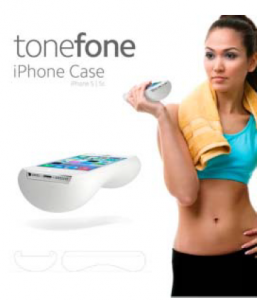 A new product billed as the “World’s Heaviest iPhone Case” will apparently turn your iPhone into a “weight loss device.” A British company, Desirable Body, created the ToneFone, a chunky iPhone 5 case that basically transforms your phone into a really light dumbbell. It comes in either 1 kilogram (2.2 lbs) or 1.5kilograms (3.3 lbs) and is made from “100% British steel” coated with “soft, durable and grippy rubber.” Depending on which weight you choose, the ToneFone costs $38 or $42, respectively, and $11.50 for shipping to the US. Every time you pick up your phone, you are getting a workout. No time for a workout at the gym or just too tired? Go home, put on your sweats, call your friends or your mom and lift that phone for 20 reps. If I could add definition to my arms by just by talking and texting, why not give it a try. The case comes in white and fits the iPhone 5 and 5s. Grey and gold versions will be arriving in June. I’m sure the instructional video is also in the works. Stream it right from your phone to your TV (if you have Apple TV). People are picking up the ToneFone as it is currently out of stock and won’t be available until April. This has to be the easiest (laziest) way to exercise and be social at the same time. Don’t forget to switch arms to get a better workout.